Please note that effective immediately there is a fire ban in our campsite. We are taking this action due to the extreme fire danger rating in our region. At this time, propane fires are acceptable within our campground. Thank you for your understanding and cooperation. This entry was posted on July 20, 2018, in Koocanusa, Koocanusa Boat Launch, Koocanusa Campsite, Koocanusa General Store, Koocanusa Marina, Lake Koocanusa. Hope you’re having a great long weekend so far, have been meaning to send this update for awhile. As you might know we are celebrating Canada’s 151st Birthday a day early today on Saturday, June 30th. So please join us for any or all of the activities below if you camp with us or are out at Koocanusa this weekend. Everyone welcome! kids, pick up your Canada Day package after 11am. Complete everything and come back at 1pm. be part of our 8th annual Koocanusa Parade. Show your Canadian pride and bring along your decorated golf cart, wagon, buggy, pet, bike or ??? Be in the parking lot at 6:45pm for a 7pm start. In other exciting news, our 2018 Koocanusa Hoodies are officially in stock! Come get yours early/while supplies last to make sure you get your size. Beat the cooler weather with our stylish sweatshirts in a range of both kids’ and adult sizes. Have a great long weekend and hope to see everyone at the lake soon. The store is officially now open 9am – 9pm until September long weekend. Happy Summer! 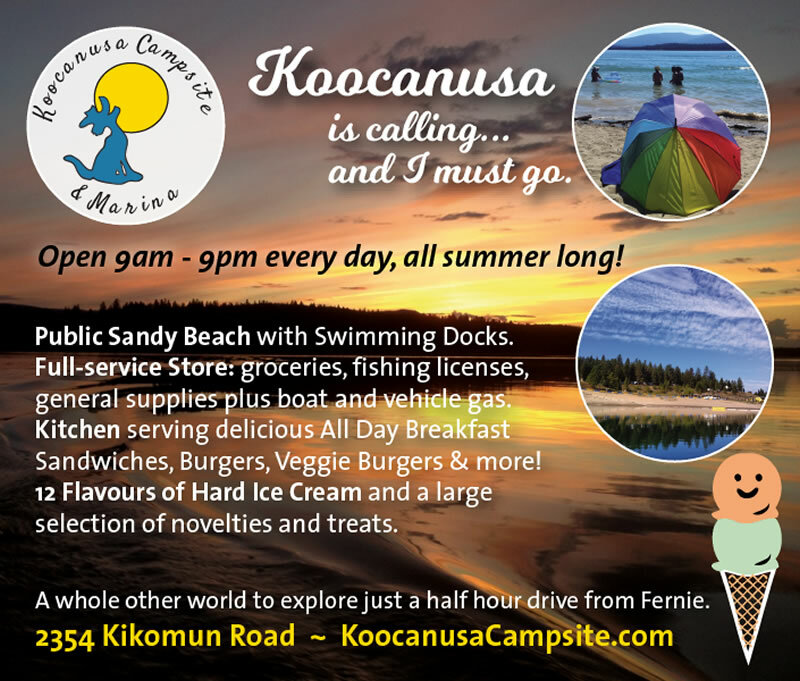 This entry was posted on June 30, 2018, in Koocanusa, Koocanusa Boat Launch, Koocanusa Campsite, Koocanusa General Store, Koocanusa Marina, Lake Koocanusa. Greetings everyone. Can you believe it’s already almost July 1st? Hope you’ve been enjoying summer so far. Here are some updates from the campground for the coming long weekend. The store is now open 9am – 9pm until the Labour Day long weekend, come get your all day breakfast sandwiches, burgers, ice cream, groceries, ice, fishing licenses, bait and camping supplies. Our food specials this weekend will be Bagels & Cream Cheese and Bagel Breakfast Sandwiches. We’ll have a dessert special too – Strawberry Supreme Sundaes for Canada’s birthday. Hey kids: pick up your Canada Day Activity package at the store at 11am. Complete everything and come back at 1pm. Join us on the deck at 1pm for some Birthday Cake to help Canada celebrate. Be part of our 7th Annual Koocanusa Parade. Show your Canadian pride and bring along your decorated golf cart, wagon, buggy, pet, bike or ____ ? Be in the parking lot at 6:45pm for a 7pm start. Our special 150 fireworks display will start at dusk (depending on weather and fire restrictions). 2017 is our 30th year here at Koocanusa Campsite & Marina. We now have limited edition commemorative reusable shopping/beach bags available for sale now, come get them while supplies last! ($5.99 each) Our 2017 hoodies will be here soon too, hopefully in time for the weekend, so come check them out. Keep an eye on our website for all the details about our 30th anniversary celebrations that will be happening on Labour Day long weekend. Please watch for the new Canada/US Border Markers when travelling south on Koocanusa. our boat launch is open and we will have boat gas available for you this weekend. please watch out for sandbars and driftwood, it is still early in season. remember to get your Boating License if you don’t already have it. if travelling on the water south to Newgate etc. please watch for the new Border Markers. It is illegal to enter the United States on the water — you must enter through a Canada/US Border Crossing. Please keep an eye out for these markers so that you can stay within Canadian waters. The weather forecast is looking excellent for this week and long weekend as well. Wishing you a great Canada Day weekend whatever you’re up to and we look forward to seeing you at the lake sometime soon. This entry was posted on June 26, 2017, in Koocanusa, Koocanusa Boat Launch, Koocanusa Campsite, Koocanusa General Store, Koocanusa Marina, Lake Koocanusa. This entry was posted on July 29, 2016, in Koocanusa, Koocanusa Boat Launch, Koocanusa Campsite, Koocanusa General Store, Koocanusa Marina, Lake Koocanusa.